Not to be confused with Cushing's triad, due to increased intracranial pressure. Cushing's syndrome is caused by either excessive cortisol-like medication such as prednisone or a tumor that either produces or results in the production of excessive cortisol by the adrenal glands. Cases due to a pituitary adenoma are known as Cushing's disease. It is the second most common cause of Cushing's syndrome after medication. A number of other tumors may also cause Cushing's. Some of these are associated with inherited disorders such as multiple endocrine neoplasia type 1 and Carney complex. Diagnosis requires a number of steps. The first step is to check the medications a person takes. The second step is to measure levels of cortisol in the urine, saliva or in the blood after taking dexamethasone. If this test is abnormal, the cortisol may be measured late at night. If the cortisol remains high, a blood test for ACTH may be done. Most cases can be treated and cured. If due to medications, these can often be slowly decreased if still required or slowly stopped. If caused by a tumor, it may be treated by a combination of surgery, chemotherapy, and/or radiation. If the pituitary was affected, other medications may be required to replace its lost function. With treatment, life expectancy is usually normal. Some, in whom surgery is unable to remove the entire tumor, have an increased risk of death. About two to three people per million are affected each year. It most commonly affects people who are 20 to 50 years of age. Women are affected three times more often than men. A mild degree of overproduction of cortisol without obvious symptoms, however, is more common. Cushing's syndrome was first described by American neurosurgeon Harvey Cushing in 1932. Cushing's syndrome may also occur in other animals including cats, dogs, and horses. Symptoms include rapid weight gain, particularly of the trunk and face with sparing of the limbs (central obesity). Common signs include the growth of fat pads along the collarbone, on the back of the neck ("buffalo hump" or lipodystrophy), and on the face ("moon face"). Other symptoms include excess sweating, dilation of capillaries, thinning of the skin (which causes easy bruising and dryness, particularly the hands) and mucous membranes, purple or red striae (the weight gain in Cushing's syndrome stretches the skin, which is thin and weakened, causing it to hemorrhage) on the trunk, buttocks, arms, legs, or breasts, proximal muscle weakness (hips, shoulders), and hirsutism (facial male-pattern hair growth), baldness and/or extremely dry and brittle hair. In rare cases, Cushing's can cause hypocalcemia. The excess cortisol may also affect other endocrine systems and cause, for example, insomnia, inhibited aromatase, reduced libido, impotence in men, and amenorrhoea/oligomenorrhea and infertility in women due to elevations in androgens. Studies have also shown that the resultant amenorrhea is due to hypercortisolism, which feeds back onto the hypothalamus resulting in decreased levels of GnRH release. Many of the features of Cushing's are those seen in metabolic syndrome, including insulin resistance, hypertension, obesity, and elevated blood levels of triglycerides. Cognitive conditions, including memory and attention dysfunctions, as well as depression, are commonly associated with elevated cortisol, and may be early indicators of exogenous or endogenous Cushing's. Depression and anxiety disorders are also common. Other signs include increased urination (and accompanying increased thirst), persistent high blood pressure (due to cortisol's enhancement of epinephrine's vasoconstrictive effect) and insulin resistance (especially common with ACTH production outside the pituitary), leading to high blood sugar and insulin resistance which can lead to diabetes mellitus. Insulin resistance is accompanied by skin changes such as acanthosis nigricans in the axilla and around the neck, as well as skin tags in the axilla. Untreated Cushing's syndrome can lead to heart disease and increased mortality. Cortisol can also exhibit mineralocorticoid activity in high concentrations, worsening the hypertension and leading to hypokalemia (common in ectopic ACTH secretion) and hypernatremia (increased Na+ ions concentration in plasma). Furthermore, excessive cortisol may lead to gastrointestinal disturbances, opportunistic infections, and impaired wound healing related to cortisol's suppression of the immune and inflammatory responses. Osteoporosis is also an issue in Cushing's syndrome since osteoblast activity is inhibited. Additionally, Cushing's syndrome may cause sore and aching joints, particularly in the hip, shoulders, and lower back. Brain changes such as cerebral atrophy may occur. This atrophy is associated with areas of high glucocorticoid receptor concentrations such as the hippocampus and correlates highly with psychopathological personality changes. Cushing's disease due to excess ACTH may also result in hyperpigmentation. This is due to melanocyte-Stimulating Hormone production as a byproduct of ACTH synthesis from pro-opiomelanocortin (POMC). Alternatively, it is proposed that the high levels of ACTH, β-lipotropin, and γ-lipotropin, which contain weak MSH function, can act on the melanocortin 1 receptor. A variant of Cushing's disease can be caused by ectopic, i.e. extrapituitary, ACTH production from, for example, a small-cell lung cancer. When Cushing's syndrome is caused by an increase of cortisol at the level of the adrenal glands (via an adenoma or hyperplasia), negative feedback ultimately reduces ACTH production in the pituitary. In these cases, ACTH levels remain low and no hyperpigmentation develops. Cushing's syndrome may result from any cause of increased glucocorticoid levels, whether due to medication or internal processes. Some sources however do not consider the glucocorticoid medication-induced condition as "Cushing's syndrome" proper, instead using the term "Cushingoid" to describe the medication's side effects which mimic the endogenous condition. Cushing's disease is a specific type of Cushing's syndrome caused by a pituitary tumor leading to excessive production of ACTH (adrenocorticotropic hormone). Excessive ACTH stimulates the adrenal cortex to produce high levels of cortisol, producing the disease state. While all Cushing's disease gives Cushing's syndrome, not all Cushing's syndrome is due to Cushing's disease. Several possible causes of Cushing's syndrome are known. The most common cause of Cushing's syndrome is the use of prescribed glucocorticoids to treat other diseases (iatrogenic Cushing's syndrome). Glucocorticoids are used in treatment of a variety of disorders, including asthma and rheumatoid arthritis, and also used for immunosuppression after organ transplants. Administration of synthetic ACTH is also possible, but ACTH is less often prescribed due to cost and lesser utility. Rarely, Cushing's syndrome can also be due to the use of medroxyprogesterone acetate. In exogenous Cushing's, the adrenal glands may often gradually atrophy due to lack of stimulation by ACTH, the production of which is suppressed by glucocorticoid medication. Abruptly stopping the medication can thus result in acute and potentially life-threatening adrenal insufficiency and the dose must hence be slowly and carefully tapered off to allow internal cortisol production to pick up. In some cases, patients never recover sufficient levels of internal production and must continue taking glucocorticoids at physiological doses for life. Cushing's syndrome in childhood is especially rare and usually results from use of glucocorticoid medication. Endogenous Cushing's syndrome results from some derangement of the body's own system of cortisol secretion. Normally, ACTH is released from the pituitary gland when necessary to stimulate the release of cortisol from the adrenal glands. In pituitary Cushing's, a benign pituitary adenoma secretes ACTH. This is also known as Cushing's disease and is responsible for 70% of endogenous Cushing's syndrome. In adrenal Cushing's, excess cortisol is produced by adrenal gland tumors, hyperplastic adrenal glands, or adrenal glands with nodular adrenal hyperplasia. Tumors outside the normal pituitary-adrenal system can produce ACTH (occasionally with CRH) that affects the adrenal glands. This etiology is called ectopic or paraneoplastic Cushing's disease and is seen in diseases such as small cell lung cancer. Finally, rare cases of CRH-secreting tumors (without ACTH secretion) have been reported, which stimulates pituitary ACTH production. Elevated levels of total cortisol can also be due to estrogen found in oral contraceptive pills that contain a mixture of estrogen and progesterone, leading to Pseudo-Cushing's syndrome. Estrogen can cause an increase of cortisol-binding globulin and thereby cause the total cortisol level to be elevated. However, the total free cortisol, which is the active hormone in the body, as measured by a 24-hour urine collection for urinary free cortisol, is normal. The hypothalamus is in the brain and the pituitary gland sits just below it. The paraventricular nucleus (PVN) of the hypothalamus releases corticotropin-releasing hormone (CRH), which stimulates the pituitary gland to release adrenocorticotropin (ACTH). ACTH travels via the blood to the adrenal gland, where it stimulates the release of cortisol. Cortisol is secreted by the cortex of the adrenal gland from a region called the zona fasciculata in response to ACTH. Elevated levels of cortisol exert negative feedback on CRH in the hypothalamus, which decreases the amount of ACTH released from the anterior pituitary gland. Strictly, Cushing's syndrome refers to excess cortisol of any etiology (as syndrome means a group of symptoms). One of the causes of Cushing's syndrome is a cortisol-secreting adenoma in the cortex of the adrenal gland (primary hypercortisolism/hypercorticism). The adenoma causes cortisol levels in the blood to be very high, and negative feedback on the pituitary from the high cortisol levels causes ACTH levels to be very low. Cushing's disease refers only to hypercortisolism secondary to excess production of ACTH from a corticotroph pituitary adenoma (secondary hypercortisolism/hypercorticism) or due to excess production of hypothalamus CRH (Corticotropin releasing hormone) (tertiary hypercortisolism/hypercorticism). This causes the blood ACTH levels to be elevated along with cortisol from the adrenal gland. The ACTH levels remain high because the tumor is unresponsive to negative feedback from high cortisol levels. When Cushing's syndrome is due to extra ACTH it is known as ectopic Cushing syndrome. This may be seen in a paraneoplastic syndrome. When Cushing's syndrome is suspected, either a dexamethasone suppression test (administration of dexamethasone and frequent determination of cortisol and ACTH level), or a 24-hour urinary measurement for cortisol offers equal detection rates. Dexamethasone is a glucocorticoid and simulates the effects of cortisol, including negative feedback on the pituitary gland. When dexamethasone is administered and a blood sample is tested, cortisol levels >50 nmol/l (1.81 µg/dl) would be indicative of Cushing's syndrome because an ectopic source of cortisol or ACTH (such as adrenal adenoma) exists which is not inhibited by the dexamethasone. A novel approach, recently cleared by the US FDA, is sampling cortisol in saliva over 24 hours, which may be equally sensitive, as late-night levels of salivary cortisol are high in cushingoid patients. Other pituitary hormone levels may need to be ascertained. Performing a physical examination to determine any visual field defect may be necessary if a pituitary lesion is suspected, which may compress the optic chiasm, causing typical bitemporal hemianopia. When any of these tests is positive, CT scanning of the adrenal gland and MRI of the pituitary gland are performed to detect the presence of any adrenal or pituitary adenomas or incidentalomas (the incidental discovery of harmless lesions). Scintigraphy of the adrenal gland with iodocholesterol scan is occasionally necessary. Occasionally, determining the ACTH levels in various veins in the body by venous catheterization, working towards the pituitary (petrosal sinus sampling) is necessary. In many cases, the tumors causing Cushing's disease are less than 2 mm in size and difficult to detect using MRI or CT imaging. In one study of 261 patients with confirmed pituitary Cushing's disease, only 48% of pituitary lesions were identified using MRI prior to surgery. Plasma CRH levels are inadequate at diagnosis (with the possible exception of tumors secreting CRH) because of peripheral dilution and binding to CRHBP. Most cases of Cushingoid symptoms are caused by corticosteroid medications, such as those used for asthma, arthritis, eczema and other inflammatory conditions. Consequently, most patients are effectively treated by carefully tapering off (and eventually stopping) the medication that causes the symptoms. If an adrenal adenoma is identified, it may be removed by surgery. An ACTH-secreting corticotrophic pituitary adenoma should be removed after diagnosis. Regardless of the adenoma's location, most patients require steroid replacement postoperatively at least in the interim, as long-term suppression of pituitary ACTH and normal adrenal tissue does not recover immediately. Clearly, if both adrenals are removed, replacement with hydrocortisone or prednisolone is imperative. In those patients not suited for or unwilling to undergo surgery, several drugs have been found to inhibit cortisol synthesis (e.g. ketoconazole, metyrapone) but they are of limited efficacy. Mifepristone is a powerful glucocorticoid type II receptor antagonist and, since it does not interfere with normal cortisol homeostasis type I receptor transmission, may be especially useful for treating the cognitive effects of Cushing's syndrome. However, the medication faces considerable controversy due to its use as an abortifacient. In February 2012, the FDA approved mifepristone to control high blood sugar levels (hyperglycemia) in adult patients who are not candidates for surgery, or who did not respond to prior surgery, with the warning that mifepristone should never be used by pregnant women. Removal of the adrenals in the absence of a known tumor is occasionally performed to eliminate the production of excess cortisol. In some occasions, this removes negative feedback from a previously occult pituitary adenoma, which starts growing rapidly and produces extreme levels of ACTH, leading to hyperpigmentation. This clinical situation is known as Nelson's syndrome. Cushing's syndrome caused by treatment with corticosteroids is the most common form. Cushing's disease is rare; a Danish study found an incidence of less than one case per million people per year. However, asymptomatic microadenomas (less than 10 mm in size) of the pituitary are found in about one in six individuals. People with Cushing's syndrome have increased morbidity and mortality as compared to the general population. The most common cause of mortality in Cushing's syndrome is cardiovascular events. People with Cushing's syndrome have nearly 4 times increased cardiovascular mortality as compared to the general population. For more information on the form in horses, see pituitary pars intermedia dysfunction. ^ a b Celik O, Niyazoglu M, Soylu H, Kadioglu P (August 2012). "Iatrogenic Cushing's syndrome with inhaled steroid plus antidepressant drugs". Multidisciplinary Respiratory Medicine. 7 (1): 26. doi:10.1186/2049-6958-7-26. PMC 3436715. PMID 22958272. ^ a b c d "What are the symptoms of Cushing's syndrome?". 2012-11-30. Archived from the original on 2 April 2015. Retrieved 16 March 2015. ^ a b c d e f g "Cushing's Syndrome". National Endocrine and Metabolic Diseases Information Service (NEMDIS). July 2008. Archived from the original on 10 February 2015. Retrieved 16 March 2015. ^ a b c d e f "How do health care providers diagnose Cushing's syndrome?". 2012-11-30. Archived from the original on 2 April 2015. Retrieved 16 March 2015. ^ a b c d "What are the treatments for Cushing's syndrome?". 2012-11-30. Archived from the original on 2 April 2015. Retrieved 16 March 2015. ^ a b c "Is there a cure for Cushing's syndrome?". 2012-11-30. Archived from the original on 27 March 2015. Retrieved 16 March 2015. ^ a b c d "How many people are affected by or at risk for Cushing's syndrome?". 2012-11-30. Archived from the original on 2 April 2015. Retrieved 16 March 2015. ^ Forbis, Pat (2005). Stedman's medical eponyms (2nd ed.). Baltimore, Md. : Lippincott Williams & Wilkins. p. 167. ISBN 9780781754439. Archived from the original on 2017-09-08. ^ a b Sharma ST, Nieman LK (June 2011). "Cushing's syndrome: all variants, detection, and treatment". Endocrinology and Metabolism Clinics of North America. 40 (2): 379–91, viii–ix. doi:10.1016/j.ecl.2011.01.006. PMC 3095520. PMID 21565673. ^ "What causes Cushing's syndrome?". 2012-11-30. Archived from the original on 2 April 2015. Retrieved 16 March 2015. ^ Nieman, LK; Ilias, I (December 2005). "Evaluation and treatment of Cushing's syndrome". The American Journal of Medicine. 118 (12): 1340–6. doi:10.1016/j.amjmed.2005.01.059. PMID 16378774. ^ "Cushing syndrome - Diagnosis and treatment - Mayo Clinic". www.mayoclinic.org. Retrieved 2019-04-21. ^ Graversen D, Vestergaard P, Stochholm K, Gravholt CH, Jørgensen JO (April 2012). "Mortality in Cushing's syndrome: a systematic review and meta-analysis". European Journal of Internal Medicine. 23 (3): 278–82. doi:10.1016/j.ejim.2011.10.013. PMID 22385888. ^ Steffensen C, Bak AM, Rubeck KZ, Jørgensen JO (2010). "Epidemiology of Cushing's syndrome". Neuroendocrinology. 92 Suppl 1: 1–5. doi:10.1159/000314297. PMID 20829610. 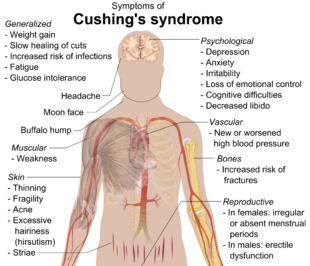 ^ "Cushing Syndrome: Condition Information". 2012-11-30. Archived from the original on 2 April 2015. Retrieved 16 March 2015. ^ Etienne Cote (2014). Clinical Veterinary Advisor: Dogs and Cats (3 ed.). Elsevier Health Sciences. p. 502. ISBN 9780323240741. Archived from the original on 2017-09-08. ^ McCue PM (December 2002). "Equine Cushing's disease". The Veterinary Clinics of North America. Equine Practice. 18 (3): 533–43, viii. doi:10.1016/s0749-0739(02)00038-x. PMID 12516933. ^ "Cushing syndrome". Mayo Clinic. March 28, 2013. Archived from the original on May 25, 2015. Retrieved 2015-05-25. ^ Fudge EB, von Allmen D, Volmar KE, Calikoglu AS (2009). "Cushing Syndrome in a 6-Month-Old Infant due to Adrenocortical Tumor". International Journal of Pediatric Endocrinology. 2009: 168749. doi:10.1155/2009/168749. PMC 2798106. PMID 20049152. ^ Lado-Abeal J, Rodriguez-Arnao J, Newell-Price JD, Perry LA, Grossman AB, Besser GM, Trainer PJ (September 1998). "Menstrual abnormalities in women with Cushing's disease are correlated with hypercortisolemia rather than raised circulating androgen levels". The Journal of Clinical Endocrinology and Metabolism. 83 (9): 3083–8. doi:10.1210/JCEM.83.9.5084. PMID 9745407. ^ Arnaldi G, Scandali VM, Trementino L, Cardinaletti M, Appolloni G, Boscaro M (2010). "Pathophysiology of dyslipidemia in Cushing's syndrome". Neuroendocrinology. 92 Suppl 1 (Suppl 1): 86–90. doi:10.1159/000314213. PMID 20829625. ^ Yudofsky SC, Hales RE (2007). The American Psychiatric Publishing Textbook of Neuropsychiatry and Behavioral Neurosciences (5th ed.). American Psychiatric Pub, Inc. ISBN 978-1-58562-239-9. ^ Andela CD, van Haalen FM, Ragnarsson O, Papakokkinou E, Johannsson G, Santos A, Webb SM, Biermasz NR, van der Wee NJ, Pereira AM (July 2015). "MECHANISMS IN ENDOCRINOLOGY: Cushing's syndrome causes irreversible effects on the human brain: a systematic review of structural and functional magnetic resonance imaging studies". European Journal of Endocrinology. 173 (1): R1–14. doi:10.1530/EJE-14-1101. PMID 25650405. ^ Dorn LD, Burgess ES, Friedman TC, Dubbert B, Gold PW, Chrousos GP (March 1997). "The longitudinal course of psychopathology in Cushing's syndrome after correction of hypercortisolism". The Journal of Clinical Endocrinology and Metabolism. 82 (3): 912–9. doi:10.1210/jcem.82.3.3834. PMID 9062506. ^ Cope LM, Shane MS, Segall JM, Nyalakanti PK, Stevens MC, Pearlson GD, Calhoun VD, Kiehl KA (November 2012). "Examining the effect of psychopathic traits on gray matter volume in a community substance abuse sample". Psychiatry Research. 204 (2–3): 91–100. doi:10.1016/j.pscychresns.2012.10.004. PMC 3536442. PMID 23217577. ^ Wolkowitz OM, Lupien SJ, Bigler ED (June 2007). "The "steroid dementia syndrome": a possible model of human glucocorticoid neurotoxicity". Neurocase. 13 (3): 189–200. doi:10.1080/13554790701475468. PMID 17786779. ^ Weber S, Habel U, Amunts K, Schneider F (2008). "Structural brain abnormalities in psychopaths-a review". Behavioral Sciences & the Law. 26 (1): 7–28. doi:10.1002/bsl.802. PMID 18327824. ^ a b Chaudhry HS, Singh G (2019). "Cushing Syndrome". = StatPearls. StatPearls Publishing. PMID 29261900. Retrieved 2019-04-20. ^ a b Baek JH, Kim SK, Jung JH, Hahm JR, Jung J (March 2016). "Recovery of Adrenal Function in Patients with Glucocorticoids Induced Secondary Adrenal Insufficiency". Endocrinology and Metabolism. 31 (1): 153–60. doi:10.3803/EnM.2016.31.1.153. PMC 4803552. PMID 26676337. ^ Nieman LK (October 2015). "Cushing's syndrome: update on signs, symptoms and biochemical screening". European Journal of Endocrinology. 173 (4): M33–8. doi:10.1530/EJE-15-0464. PMC 4553096. PMID 26156970. ^ Siminoski K, Goss P, Drucker DJ (November 1989). "The Cushing syndrome induced by medroxyprogesterone acetate". Annals of Internal Medicine. 111 (9): 758–60. doi:10.7326/0003-4819-111-9-758. PMID 2552887. ^ Broersen LH, Pereira AM, Jørgensen JO, Dekkers OM (June 2015). "Adrenal Insufficiency in Corticosteroids Use: Systematic Review and Meta-Analysis". The Journal of Clinical Endocrinology and Metabolism. 100 (6): 2171–80. doi:10.1210/jc.2015-1218. PMID 25844620. ^ Stratakis CA (December 2012). "Cushing syndrome in pediatrics". Endocrinology and Metabolism Clinics of North America. 41 (4): 793–803. doi:10.1016/j.ecl.2012.08.002. PMC 3594781. PMID 23099271. ^ Cushing's Syndrome Archived 2011-04-10 at the Wayback Machine at The National Endocrine and Metabolic Diseases Information Service. July 2008. Citing: * Nieman LK, Ilias I (December 2005). "Evaluation and treatment of Cushing's syndrome". The American Journal of Medicine. 118 (12): 1340–6. doi:10.1016/j.amjmed.2005.01.059. PMID 16378774. ^ Schteingart DE, Lloyd RV, Akil H, Chandler WF, Ibarra-Perez G, Rosen SG, Ogletree R (September 1986). "Cushing's syndrome secondary to ectopic corticotropin-releasing hormone-adrenocorticotropin secretion". The Journal of Clinical Endocrinology and Metabolism. 63 (3): 770–5. doi:10.1210/jcem-63-3-770. PMID 3525603. ^ Voyadzis JM, Guttman-Bauman I, Santi M, Cogen P (February 2004). "Hypothalamic hamartoma secreting corticotropin-releasing hormone. Case report". Journal of Neurosurgery. 100 (2 Suppl Pediatrics): 212–6. doi:10.3171/ped.2004.100.2.0212. PMID 14758953. ^ Katz J (October 1992). "Motive to sin". Nature. 359 (6398): 11–18. doi:10.1136/jcp.s1-3.1.11. PMC 1436049. ^ Raff H, Findling JW (June 2003). "A physiologic approach to diagnosis of the Cushing syndrome". Annals of Internal Medicine. 138 (12): 980–91. doi:10.7326/0003-4819-138-12-200306170-00010. PMID 12809455. ^ Jagannathan J, Smith R, DeVroom HL, Vortmeyer AO, Stratakis CA, Nieman LK, Oldfield EH (September 2009). "Outcome of using the histological pseudocapsule as a surgical capsule in Cushing disease". Journal of Neurosurgery. 111 (3): 531–9. doi:10.3171/2008.8.JNS08339. PMC 2945523. PMID 19267526. ^ Blevins LS, ed. (2002). Cushing's syndrome. Boston: Kluwer Academic. p. 115. ISBN 978-1-4020-7131-7. ^ "Cushing syndrome: MedlinePlus Medical Encyclopedia". medlineplus.gov. Retrieved 16 March 2018. ^ Belanoff JK, Flores BH, Kalezhan M, Sund B, Schatzberg AF (October 2001). "Rapid reversal of psychotic depression using mifepristone". Journal of Clinical Psychopharmacology. 21 (5): 516–21. doi:10.1097/00004714-200110000-00009. PMID 11593077. ^ "FDA approves mifepristone (Korlym*) for patients with endogenous Cushing' s syndrome". February 18, 2012. Archived from the original on September 9, 2012. ^ Aggarwal S, Yadav K, Sharma AP, Sethi V (June 2013). "Laparoscopic bilateral transperitoneal adrenalectomy for Cushing syndrome: surgical challenges and lessons learnt". Surgical Laparoscopy, Endoscopy & Percutaneous Techniques. 23 (3): 324–8. doi:10.1097/SLE.0b013e318290126d. PMID 23752002. ^ Nelson DH, Meakin JW, Thorn GW (March 1960). "ACTH-producing pituitary tumors following adrenalectomy for Cushing's syndrome". Annals of Internal Medicine. 52 (3): 560–9. doi:10.7326/0003-4819-52-3-560. PMID 14426442. ^ Lindholm J, Juul S, Jørgensen JO, Astrup J, Bjerre P, Feldt-Rasmussen U, Hagen C, Jørgensen J, Kosteljanetz M, Kristensen L, Laurberg P, Schmidt K, Weeke J (January 2001). "Incidence and late prognosis of cushing's syndrome: a population-based study". The Journal of Clinical Endocrinology and Metabolism. 86 (1): 117–23. doi:10.1210/jcem.86.1.7093. PMID 11231987. ^ Ezzat S, Asa SL, Couldwell WT, Barr CE, Dodge WE, Vance ML, McCutcheon IE (August 2004). "The prevalence of pituitary adenomas: a systematic review". Cancer. 101 (3): 613–9. doi:10.1002/cncr.20412. PMID 15274075.